Abstract: This is technically a 'zero noise' heatsink - a cooler which in and of itself produces exactly 0 dBA of noise. There have been very few entirely passive heatsinks across this test bench - perhaps only five since we began reviewing heatsinks in 1999... What really makes the TS Heatronics NCU-1000 stand out, is that it is an entirely passive heatsink for the Intel Pentium 4 processor (max. 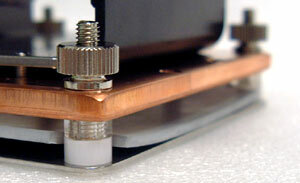 2.8GHz). The NCU-1000 (care of Scythe Co.) does not come with a fan, but nor is there any place on the heatsink to actually attach one should you decide to add a fan of your own. Instead, the NCU-1000 makes use of the airflow that already exists within a computer case to keep itself, and the processor below, cool. A distinction which needs to be made early on is that while this is technically a 'zero noise' heatsink - a cooler which in and of itself produces exactly 0 dBA of noise - it cannot operate without some degree of airflow within the computer enclosure. So whether that airflow comes in the form of convection currents, or more likely, from the intake and exhaust fans of a powersupply and case, the heatsink needs some degree of air moving over its folded aluminum fins in order for it to work. I suppose you could think of this way, while the TS Heatronics requires no direct cooling, or noisy fan, it does indeed need the airflow generated by them to operate within comfortable temperature levels. For the purposes of this review, we will be using a single 92mm x 92mm low-noise Zalman fan set at 6" and 12" distances from the TS Heatronics NCU-1000 heatsink, to replicate typical computer case air flow in an impingement fashion. I can tell you right now, the temperature results we saw were not at all what we expected to see from a passive heatsink! HS Material: Aluminum fins, Heatpipe, Copper base, stainless steel plate. The NCU-1000 comes unassembled, and packed rather neatly in a small box. Because of the way the cooler is attached, you will need to remove you entire motherboard to install this heatsink. A stainless steel backplate, insulating layer, long screws, and several other parts are included to ensure the heatsink stays firmly in place once installed. 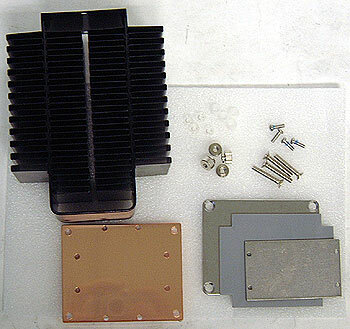 The first step once all the parts are laid out is to assemble the upper heatsink portion which consists of the thick copper base plate, a stainless steel retention plate, and the "U" shaped heatpipe component. If you don't take a few minutes to read the instructions, right about here is where you can seriously muck up the entire installation procedure. The reason is pretty simple, the copper base plate will accept the heatpipe in one of two ways, each 90 degrees to the other. Depending on how the Pentium 4 socket is oriented on the motherboard in your PC, the heatpipe will be oriented in one of those two ways. 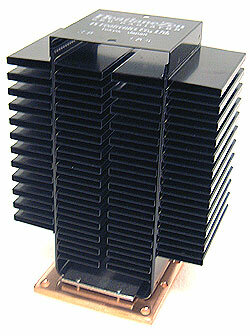 List all TS Heatronics heat sinks that Frostytech tested?